We’re often asked about the dos and don’ts of using retinol: Do alpha or beta hydroxy acid (AHA and BHA) exfoliants “deactivate” retinol or reduce its effectiveness? Should I only use retinol at night? Are retinol products incompatible with vitamin C products? Simply stated, No. We’ve seen no scientific research to indicate otherwise. There’s also a common fear that retinol may aggravate skin. Although it’s true that not everyone can use every skincare product with success, formulary concerns or other problem ingredients are often the culprit—not necessarily the retinol; so it’s important to choose only well-formulated products that steer clear of irritating ingredients, and to monitor how your skin responds to different strengths of retinol. Our aim is to help you achieve the best skin of your life, and that starts with accurate information. As always, we turn to the research to put an end to any worry or confusion. No research has ever demonstrated or concluded that alpha or beta hydroxy acid (AHA or BHA) exfoliants make retinol any less effective when used in the same skincare routine. It’s just one of those myths that gets repeated so often that people—even those we consider skincare experts—tend to believe it. Whenever we see a comment or recommendation about retinol’s incompatibility with AHA or BHA exfoliants, it’s never supported by research. What research does show is that using retinol products with an effective AHA or BHA product increases the benefits of each; it doesn’t decrease them. What's more, this combination can be an effective approach suitable even for those dealing with milia-prone skin. Myth #2: The pH of AHA & BHA exfoliants reduces retinol’s effectiveness. Well-formulated leave-on exfoliants have a low pH, which is what makes them effective. It’s common for people to wonder if that pH level disrupts retinol’s ability to work its gentle, skin-smoothing magic. Rest assured, it doesn’t. Just like most skincare rumors, this myth sprang from a misunderstanding about the research. Only one study mentions the issue of pH affecting retinol’s activity, but that study was performed on proteins in a petri dish, not on real skin—and it concluded that it’s unknown if these results would replicate on intact skin. If anything, AHAs and BHA actually help products deliver their vitally important ingredients (like retinol) by removing the dead skin that limits their absorption. It’s a popular misconception that retinol is an exfoliant. It isn’t. Retinol is an antioxidant, and an important skin-restoring ingredient. It enhances multiple aspects of skin on many levels, making it look healthier, smoother, and more vibrant. And, while retinol can cause a flaking reaction for some people, this (often temporary) side effect shouldn’t be mistaken for exfoliation. AHAs and BHA help to imperceptibly shed dead skin from its surface. You don’t see or feel healthy, normal exfoliation. If you do experience flaking from using retinol, it may be that you’re using a retinol product that’s just too potent for your skin; switching to a lower strength could solve the problem. You can also try using the retinol product (or the exfoliant) less frequently. Myth #4: You can’t use retinol during the daytime. It’s perfectly fine to use retinol products during the day, as long as you wear sunscreen over them. 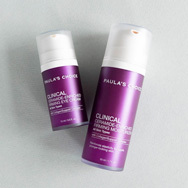 Research has shown that retinol and vitamin C work well under SPF-rated products, and that vitamins A, C, and E—even in combination—remain stable and effective under a broad spectrum sunscreen. Remember: Retinol plays its part to help skin look younger, but sunscreen is the first and most formidable defense in helping skin rebuff signs of ageing like wrinkles, uneven skin tone, and loss of firmness. The (misguided) concern about combining these ingredients is also based on misconceptions about pH and acidity. Vitamin C, especially ascorbic acid, requires a low pH to remain stable—or no pH, if there isn’t any water in the formula. The result is a more acidic environment, but we know acidity doesn’t deactivate retinol; after all, skin’s pH is naturally acidic and retinol naturally occurs in skin. Better yet, research has shown that a combination of vitamins in cosmetics will provide optimal results—including vitamins A (another name for retinol), C, and E. Vitamin C actually helps retinol work better by stabilising it, extending its effectiveness. It turns out that using retinol without vitamin C or another potent antioxidant could keep your skin from reaping all of retinol’s benefits. It’s perfectly fine to use retinol products during the day, as long as you wear sunscreen over them. Research has shown that retinol and vitamin C work well under SPF-rated products, and that vitamins A, C, and E—even in combination—remain stable and effective under a broad spectrum sunscreen rated SPF 30 or greater. Remember: Retinol plays its part to help skin look younger, but sunscreen is the first and most formidable defense in helping skin rebuff signs of aging like wrinkles, uneven skin tone, and loss of firmness. Better yet, research has shown that a combination of vitamins in cosmetics will provide optimal results—including vitamins A (another name for retinol), C, and E. Vitamin C actually helps retinol work better by stabilizing it, extending its effectiveness. It turns out that using retinol without vitamin C or another potent antioxidant could keep your skin from reaping all of retinol’s benefits.